A web banner or banner ad is a form of advertising on the internet delivered by an ad server or some other means. Apparel Search allows members of the fashion industry to use either text or banners to sponsor pages on our website as a method to draw visitors attention. This form of online advertising simply entails embedding an advertisement into a web page. In order to do this, your company would need to provide an image file and information about the location (URL address) that they banner would link to on your website. It would need to fit into certain size requirements. The advertising banner is intended to attract traffic to a website by linking to the website of the advertiser. Web banners function the same way as traditional advertisements are intended to function: notifying consumers of the product or service and presenting reasons why the consumer should choose the product in question. The Apparel Search fashion guide allows for advertisements to be placed on certain pages of our website. The style, shape, content, and size of the advertisements are reviewed on a case by case bases prior to launching the ad campaign. Note: we do NOT currently use pop under or pop up advertising. Also, we don't guarantee we will use all of the sizes or styles illustrated above. 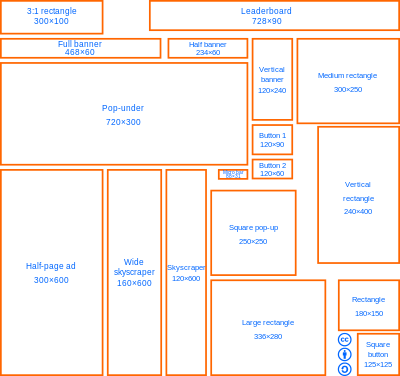 It will depend on the layout of the individual page being discussed for advertising. All sizes need to be discussed and reviewed on a case by case basis. You can also use other shapes and sizes. In addition, you are welcome to use TEXT messages. We are fairly flexible. Make a suggestion and we will try to accommodate you. If you would like to be kind and create a link back to Apparel Search you are welcome to do so. You can link to our site from text links or you can utilize one of our Apparel Search logos.